Last Friday, Imagine!’s Director of Information Technology Kevin Harding was among the presenters at the 2015 ANCOR & AAIDD Technology Summit & Showcase. 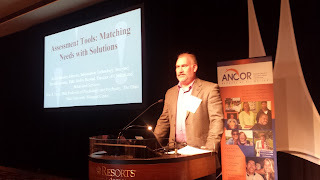 Kevin was part of a panel discussion titled “Assessment Tools: Matching Needs with Solutions,” and spoke specifically about a functional assessment Imagine! developed for measuring a person’s abilities across a wide range of physical and cognitive categories, as well as a site based assessment in development at Imagine! for identifying necessary adaptations in a given setting. Joining Kevin on the panel were Patrick Queenan, PhD, Director of Clinical and Behavioral Services at Ability Beyond, and Marc J. Tasse, PhD, Professor of Psychology and Psychiatry at The Ohio State University Nisonger Center. Congratulations, Kevin, for presenting at this prestigious event and for continuing Imagine!’s legacy as a leader in the field of exploring how technology may be used to improve the lives of individuals with a variety of disabilities.